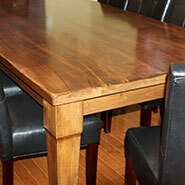 Custom Woodwork, Cabinetry and Furniture - Joe Coholic Custom Furniture Ltd. 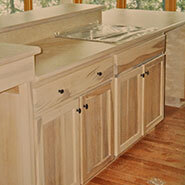 When it comes to cabinets and case-goods, our product is made to a much higher quality standard than most. All cabinetry is based upon grooved and dado construction which is glued together – not relying on screws or nails. Whether it is European style frameless construction, or traditional face frame cabinetry – the foundation of our cabinets is the same: a high quality box made from industrial grade materials, built to remain strong and true over many years. Face frames are grooved and glued on, with mortise and tenon joints. We only make cabinets with full backs that are set in and glued, and full tops – for the ultimate in strength and long term durability. We will work in whatever materials you require (any type of wood veneers & core materials) as well as man-made products such as melamine and other materials. Our wooden cabinets are finished inside and out with a high quality, industrial lacquer – which is easy to clean, durable and water & stain resistant. Any type of finish is possible, from natural to any color of stain, to an unlimited choice of solid color finishes in various sheens. Interior shelving and drawers are made to match the cabinets – with solid wood, dovetailed drawers and the latest high end slides, to all metal shelf adjustments, and only the best in hinges. Click here to view our work. Manufacturing high quality furniture is what we do best! Starting with the finest furniture grade hardwood lumber – we can design and build you any type and style of furnishings. We use a combination of traditional woodworking techniques, along with the most modern of methods & materials, to create furniture that is made not only to look great – but to function day after day for a lifetime or more. Each piece is hand crafted – from the initial design process, to the final finishing and assembly. With several decades of experience, we can assure you are getting only the highest quality when it comes to any type of furniture we create. Any hardware we use comes with a lifetime warranty, and our finish is a modern industrial lacquer which offers a high durability and wear resistance. With our modern CNC capability, we can also offer custom carvings, or decorative aspects that many shops are not able to do. Click here to view our work. We can manufacture any style of custom door – interior or exterior – in either a solid wood paint grade, or in any hardwood you choose. Raised panels, flat panel (Shaker style), etc – there is no limitation. Custom glass inserts are also possible. We can fabricate and install all kinds of custom railings, with our own turned components that can be made to your specifications. Interior moldings – from base boards, door jambs and casings, window sills & trim, etc. Any type of molding is possible and we can do almost any type of profile – with custom matching older, existing profiles one of the special services we offer. For any other custom woodworking trim you require – just contact us to discuss. Click here to view our work. 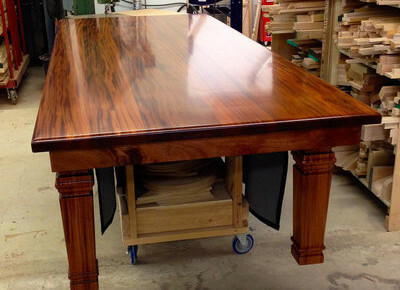 If you have an existing piece of furniture that needs some TLC – we provide full refinishing and restoration services. From a straight repair of a piece - to a full tear down, rebuild and refinish… We can work with you to preserve the old look of a piece of furniture – and bring it back to day-to-day functionality. 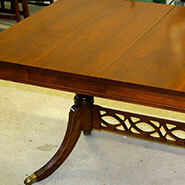 Or you can chose to completely restore a piece to make it look like it was just made today. We are very experienced in most repairs, and can also repair veneer work or decorative items such as carvings and appliques. Click here to view our work. JOE COHOLIC CUSTOM FURNITURE LTD.
“Where we strive to produce the highest quality woodwork – the way things should be made! Using the highest quality materials, hardware and finishes coupled with years of hands on experience – we strive to produce furniture and cabinetry that both looks great and is extremely well made – and will provide you with a lifetime of function and use. We can manufacture any style of table, in any wood and sized to suit your space & seating requirements. If you are ready for a truly custom, one of aREAD MORE.. 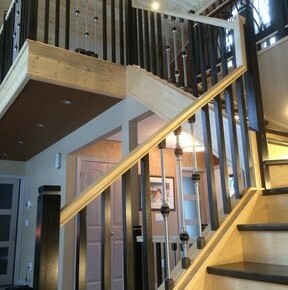 This is a hard maple stair case and railings (in natural and black stained finish) currently being finished up. 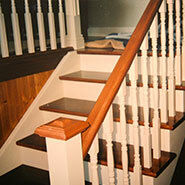 We can do many styles of custom hand rails, posts, andREAD MORE..